Tuscany (in Italian Toscana ) is a region in the center of Italy. It has an area of 22,990 km² and a population of about 3.6 million people (in 2004). The capital is Florence. Tuscany is known for its landscapes and its artistic legacy. Six Tuscan localities have been made UNESCO protected sites: the historical center of Florence (1982), the historical center of Siena (1995), the square of the Cathedral of Pisa (1987), the historical center of San Gimignano (1990), the historical center of Pienza (1996) and the Val d'Orcia (2004). 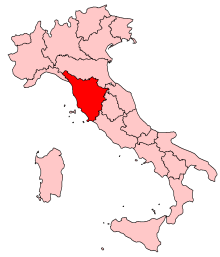 Tuscany, bordering Emilia-Romagna to the north, Liguria to the north-west, Tyrrhenian Sea to the west, Umbria and Marche to the east, Lazio to the south-east. The territory is two thirds hilly and one fourth mountainous. The remainder is constituted of the plains that form the valley of the Arno River. Tuscany is known for its wines (most famous of which are Chianti, Morellino di Scansano, Vino Nobile di Montepulciano, and Brunello di Montalcino) and has 120 protected regions (nature reserves). Other agricultural products include Chianina cattle (particularly the famous "Fiorentina" steak) and the production of olive oil, principally in Lucca. Tourism is the economic principally of the called "Cities of Art" (Florence, Arezzo, Lucca, Pisa, Siena, San Gimignano), as well as on the coast and in the isles (Elba). In the '80s and '90s the region attracted an intense influx of immigrants, in particular from China and Northern Africa. There is also a significant community of British and Americans. As of 2006, the Italian national institute of statistics ISTAT estimated that 215,490 foreign-born immigrants live in Tuscany, about 5.9% of the people in Tuscany. This page was last changed on 15 July 2015, at 05:22.